Do I need a moving permit? Yes, whether you move into the Township, out of the Township or within the Township a moving permit must be acquired. The moving permit is $1 and can be found online and at the Township office. Please contact Lehigh County Voter's Administration at 610-782-3194. Where can I find information about the Ironton Rail Trail? Who is our police department? 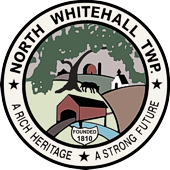 North Whitehall Township is served by the PA State Police from the Bethlehem Barracks, Emergency #911, non-emergency #610-861-2026. Where can I get rid of my old cell phone? North Whitehall Township collects cell phones for soldiers. Please drop off you cell phones in the front lobby. Who are the local youth associations in North Whitehall Township? Do any of the parks have a place to have a birthday and/or graduation party? Yes, Independence Park has 2 pavilions for rental. Call the Township for more information. Who do I call for my property value and assessment? Call Lehigh County Assessment Office at 610-782-3038. Our office is open Monday thru Friday 7:30am until 4:00pm, closed holidays and weekends. Do you accept credit cards for payments? No, we do not accept credit cards for payments. The Township only accepts cash, checks and money orders. The Township records do not maintain the property lines, please check your deed or hire a surveyor to have your property surveyed. Is there a secure area I can leave something for the Township after business hours? Yes, to the left of the front double doors of the administrative building, there is a drop box. Please drop your items in this locked box. Do you need an inspection for a property resale? No, at this time, North Whitehall Township does not required a home inspection for resale of your property.